Take one roll of Super 8mm film. Shoot the film with all edits in-camera. Send the film can, unexposed and unseen, to Revel8 Super 8mm film festival. Have it scored by the talented composition students at WAPA. And what have you got? Holiday! Written and directed by Tuuli Forward and Andrew O’Keefe – both of whom also act in the film – Holiday brings fun back to the serious business of filmmaking. Taking only a day to make, shooting this film was great joy. A close friend, Luc Houselander, was handed the camera (his first film ever) the shoot the action and it was run-and-gun from there. 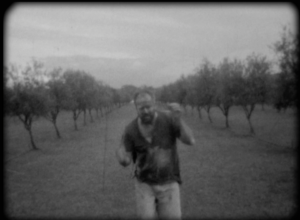 Shooting on a 50 year old Super 8mm camera turned out to be somewhat problematic. The camera had no reliable footage counter so, appropriately, our film has no reliable ending! We shot the end, but it’s not in the film. And it’s all the better for it! With many thanks to Joe de Kock from WAPA for the blistering avant-garde soundtrack! So, check it out here. And next year, grab a camera, grab a friend and shoot a Super 8mm film. It’s great fun!